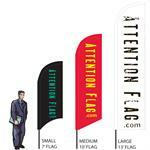 Discovering the perfect standard rectangular custom flags and banners for your needs is simple when you shop with AttentionFlag.com. 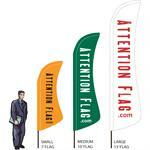 Our business is proud to offer high-quality, low-price econo-poly flags for larger production runs. 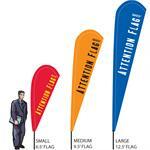 Whether you are purchasing econo poly feather flags or are interested in teardrop flags, these selections are printed on the best polyester fabrics available overseas. 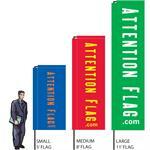 When you place your order for multiple flags, it is important to note that minimums vary depending on size and style. Our business has gone to great lengths to ensure that we are providing you with the best quality imported flags in the industry. It doesn’t matter how low the price gets for these selections, it is important that we provide you with the best custom flags and banners. 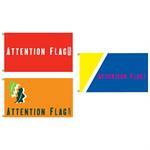 While production time is typically longer for these flags, we know you’ll still be happy with the products you receive. 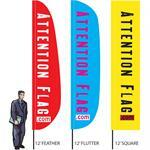 Take a look at these feather flags, econo poly teardrop flags, and other selections and place your order today.